A radioactive leak through the floor of a nuclear fuel factory in Columbia, South Carolina has contaminated the soil around it, which has been found to contain a 1,300-fold elevation of uranium above the normal limit. Tests to determine if groundwater has been contaminated are pending. The water table around the plant is shallow, and seeps into area creeks and a river floodplain. The BPEarthwatch film linked above says that officials believe that the leak did indeed reach groundwater, however, and The State newspaper published in Columbia says that the plant has been leaking into area groundwater for 35 years. BPEarthwatch recommends that a study begin on the incidence of cancer in the area. Government agencies need to explain how long the contamination went on and how much radiation has been released. A portion of the same plant was forced to shut down two years ago due to unacceptable levels of uranium in another part of the building, which belongs to Westinghouse Electric Company. The L.V. Sutton nuclear energy generating plant in North Carolina belonging to Duke Energy, which had suspended operations as Hurricane Florence flood waters encroached a week ago, has now been placed on the highest alert possible as the dam around it that is adjacent to the cooling ponds was breached when the Cape Fear River flooding caused a lake to overflow its banks. I-95, the main north-south artery of the East Coast, is still closed down in North Carolina, and drivers are being routed west into Tennessee. A section of that highway is also shut down in South Carolina. Much of I-40, the main east-west artery through the middle of the U.S., also has large sections which are closed. Travelers are advised not to use GPS road advisory apps, as they could inadvertently lead to flooded areas, causing motorists to become trapped. Meanwhile, although many in the north are mentally shifting gears to cool and crisp weather accompanying the Equinox, more tropical disturbances in the Atlantic may be on the way. 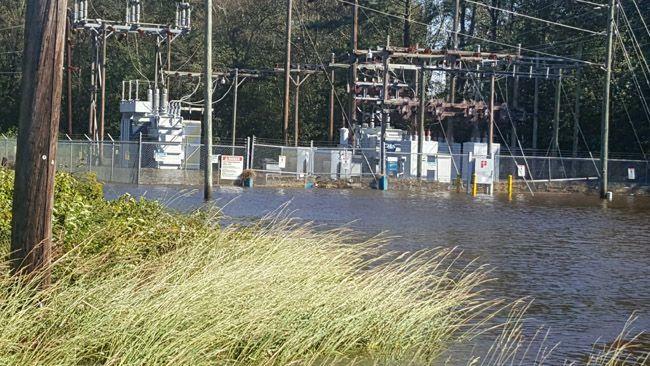 One of 115 Duke Energy sub-stations flooded by Hurricane Florence. The current breach at the Wilmington site is separate from the rupture at a nearby coal ash landfill reported at the site last weekend, spilling enough material to fill 180 dumptrucks. Here we have yet another highly gifted youngster who, at the age of 14, had reworked what he considered to be our 1950's-era outmoded nuclear power plant design with a failure-proof safety mechanism in which radioactive material cannot escape the core. If anyone doubts him, they might want to be aware that at a slightly younger age, he had already enriched uranium, with the government's awareness, and single-handedly designed and built his own functioning nuclear reactor. He does keep his yellow-cake under lock and key though. He was bored silly in junior high. What a priceless video of an incredible guy! I really enjoyed the scene where he was in his little blue outfit, as a youngster, demo-ing something, at school I think. So cute! But what an intellect and here's wishing him all the best in his endeavors!